There is no better way to bring light into an indoor space then with a fixture that truly makes a statement. The Arco lamp replica commands just that, a striking aesthetic that’s sure to reel in the glances of all those whose eyes fall upon it. Its long neck, glimmering stainless steel finished body and marble base is an amalgamation worth noticing. The mixing of different objects, shapes and materials in such harmony pinpoints the skill and innovation of the Castiglioni brothers, who are highly revered midcentury designers from Italy. 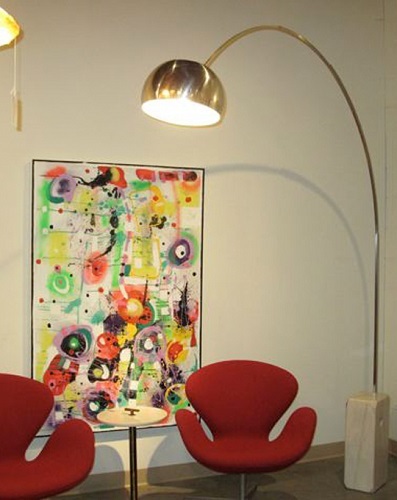 Dubbed the Castiglioni Arco lamp, or Castiglioni floor lamp, this lamp paved the way for the production and popularization of overhead lamps. 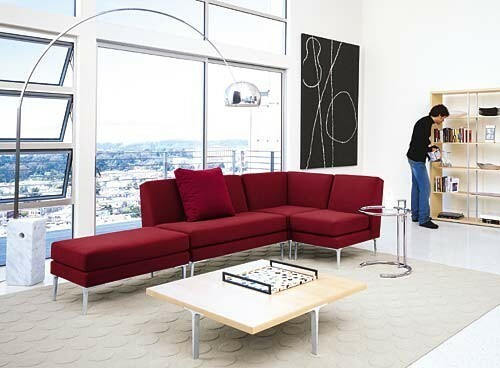 But there is only one lamp that can brighten up your space as aptly as a floor lamp and that is the Arco lamp. Behold our Arco lamp replica in beautiful indoor spaces. Though the Arco lamp was created to shine light onto a desk or table, it can be used to bring light wherever you see fit. With its arching body and high-rise head, it can bring light to otherwise difficult places that have no light or require extra lighting. Matching the Arco lamp replica’s stainless steel, the Eilene Grey Side Table is a handy table for sitting on the couch or roving about this living room space. As unique a combination as the materials and styles in the Arco lamp itself, this dining area is hybrid of a traditional dinner setting with… a corporate office. Yes, or furniture makes this possible! This elegant dining table features office seating. It is surrounded by our Group Management Office Style Chairs, also Eames replicas. This hybrid setting is a perfect match for the Arco lamp replica, which is a hybrid of sorts itself. This setup will truly impress a dinner party, especially for those who do not like to sit still, as the Management office chairs swivel and turn. Notice how well the furniture melds with the Arco lamp with its light hues of grey, cream and white. The side and center tables create an illusion of mesh-like transparency, adding to the ethereal look this room presents. The marble base will not be seen as well when a side table is standing in front of it, however, the above side table is small with a slightly transparent body, thus it does not obstruct the marble base from view. If you enjoy the airy, graceful etherealness of this setup, the Arco lamp is a great place to start this look. Place it with like colors that are on the lighter side. This living area incorporates a black and white layout in a subtle way as well. The Arco lamp vamps up the boldness in this room, while simultaneously toning it down with this near daredevil interior design (dark blue brick wall, anyone?) Two petal chairs and a spiky plant up the daring factor in this relatively dark room. The bright, navy blue brick wall shimmers all the more sleekly with the Arco lamp shining beside it. With blacks, dark blues and even a tint of red, the Arco lamp’s neutral stainless steel lacquer blends in organically without making the room look over the top. The addition of vases matches the navy blues and vamps up the living space. The ones on the table are gleam with the pouring of light from the Arco lamp replica.